MOSCOW, July 6. /TASS/. 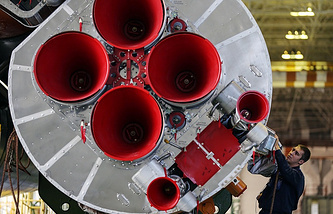 The first flight model of the new Russian super-heavy carrier rocket will be lightweight due to the use of three, instead of five, rocket modules at the first and second stages, a source in the space rocket industry told TASS on Thursday. "In order to galvanize work on the super-heavy carrier rocket and save costs at the same time, it is planned to test the first model in 2028, using the lightweight version of the rocket," he said. As he put it, the rocket was named "Super-Heavy Complex-3" or "Energiya-3" ("Energy-3"), the figures standing for the number of rocket modules at the first and second stages that will be, in fact, the Soyuz-5 medium-lift rockets. Unlike the Energiya-5 version, capable of lifting about 100 tonnes (the payload needed for a rocket to be called super heavy-lift), its lightweight version will be capable of lifting about 68 to 72 tonnes into space (if the third stage is hydrogen-fueled) and will be a heavy-lift rocket. It was earlier stated that the start of the new super-rocket’s design might be determined in the coming weeks and would last one and a half or two years. During this time, designers will have to determine the rocket design, its specifications and set out the tasks it may be used for. The document also states the head organization and cooperation on the rocket design. The Roscosmos state corporation declined to comment on this information. The first launch of the super-heavy carrier rocket was earlier reported for 2028, whereas its launch pad at the Vostochny Cosmodrome should be ready by 2027. The construction of the launch infrastructure will start after the launch pad for the Angara rocket is complete. As a source in the rocket and space industry said, the launch pad for the super-heavy rocket will be built using the principles implemented for the Energiya carrier rocket at the Baikonur Cosmodrome (site No. 250). It will be the Universal Stand-Start Complex capable of launching both the Soyuz-5 medium-lift carrier rockets and groups of rockets which may consist of carriers with different payload, including the super-heavy rocket. In 2016, Energiya Rocket and Space Corporation CEO Vladimir Solntsev presented at a Moscow conference his project of the Energiya-5V super-heavy carrier rocket designed for a manned lunar mission. As he put it, the liquid-hydrogen upper stage for the Angara-A5V carrier will be used in the super-heavy rocket’s design along with the first and second stages of the advanced Soyuz-5 medium-lift rocket. 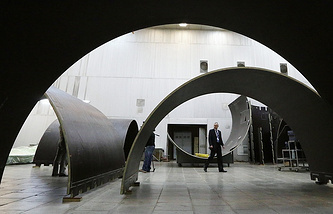 The source told TASS later that Energiya had roughly designed two versions of rockets to be built: the Energiya-5V-PTK (liftoff mass of 2,368 tonnes) and the Energyia-5VR-PTK (liftoff mass of 2,346 tonnes). Both versions are capable of delivering about 100 tonnes of payload into low-earth orbit and 20.5 tonnes to lunar orbit - the estimated mass of the lunar version of the Federatsiya spacecraft. A lunar take-off and landing module can be mounted on a carrier rocket instead of a spacecraft. The Block DM space tug will be used to deliver the Federatsiya spacecraft or a lunar take-off and landing module to the Moon. According to Roscosmos, the construction of the super-heavy rocket and its infrastructure at the Vostochny Cosmodrome will cost 1.5 trillion rubles ($25 billion). The corporation earlier stated that there was no need to urge the construction of the super-heavy carrier rocket as no payloads were available for it. According to the Energiya Rocket and Space Corporation, the development of the new Russian super-heavy carrier rocket will be 1.5 times cheaper than the re-production of the Soviet-era Energiya carrier. The construction of the Energiya rocket and the Buran space shuttle, which were annually financed 1.3 bln rubles ($2.2 mln) by 1985, became the most ambitious program in the history of the domestic space rocket production. The Energiya was first launched on May 15, 1987 from the Baikonur Cosmodrome. It became the first Soviet rocket that used hydrogen fuel at the upper stage, as well as the most powerful domestic rocket.